Newarkers have traveled by land whether on horse, stagecoach, trolley, bus or auto from earliest times while movement along the river or in trains and airplanes has varied by century. Despite the vital importance of sail and steamboats in the 18th and 19th centuries, and railroads and airplanes today, streets were, and are likely to remain paramount in moving people and things from one place to another forever. For that reason, in a two-part series that begins today we will look at some of the Indian trails, turnpikes, streets and superhighways that crisscross the city. For almost 500 years, before the coming of the Europeans to Newark, an Indian trail ran north from Cape May and was used by the Raritans for their semi-annual journey to their hunting grounds. A second east-west route connected the interior with the sea for clam gathering somewhere near Newark Bay. In some cases, parts of these early routes were incorporated into the early roads of the settlers, but unlike many of today's engineering projects, the trails followed the lines of least geographical resistance by going around a hill, avoiding a swamp or skirting an obvious obstacle. When Newark was established, its great north-south artery was laid out almost immediately to be 8 rods or 132 feet wide. Market Street, which traversed it at the Four Corners, was 6 rods or 99 feet wide. It is thought that the latter was actually part of a Hackensack trail running in an east-west direction, splitting in the west into three branches. Paralleling Broad Street to the west was West Back Street (later Washington) and on the east, East Back Street (Mulberry Street), both 4 rods or 66 feet wide. Broad Street originally extended from what is now the Lincoln Park district in a straight line to Trinity/St. Philips where it bends to the left and then proceeds north to the Plume House and on to Clay Street. The reason for the break in the straight line is that it follows the natural curve of the river. Glance at a map, and you will see the route. Man-made features of Broad Street include today's Washington Park known first as the Market Place. The Lower Commons or Green, today's Military Park was set aside as a drill or training ground for troops, thus the name Military Park. It was here that the militia drilled in time of potential danger to protect the community, and for the Revolutionary and Civil wars. At the south end of Broad Street was a large farm later purchased as Newark was incorporated and became the third Broad Street park first known as South Park, later Lincoln Park. Individual house lots were distributed to the first settlers along the street, the first meeting house was built near the Four Corners, and the home of Robert Treat was completed at the southeast corner of the intersection. At Branford Place, along the west side of Broad Street, stood the second structure of Old First Church to be replaced in 1791 by the 'new' and present brownstone Georgian church building. One of the earliest descriptions of Broad Street comes from 1796 when it was reported as having only 56 buildings lining it from today's Lincoln Park on the south to Rector Street at Trinity Church on the north. The other church building at that time, Old First, lay midway in its course. Newark Academy was on the site of the street bearing its name, the original building having been burnt in a British raid in the Revolution, and the Essex County Jail and Court House was on the site of today's Grace Episcopal Church at Walnut Street. The northern limit of the street was considered Bridge Street, and Camp Street was its southern confine. The bridge over the Passaic was considered out of town, and to the west old High Street was the site of only a few farmhouses. The great 19th century Victorian mansions were still to be built, and a good portion of the road was known as 'Lovers Walk.' To the west were only fields and woods. The upper end of Broad Street beyond the Mill Brook, at Seventh Avenue was the site of the old Ogden mansion with its tastefully laid out terraced grounds, its simple plazas and stuccoed walls, (and) it presented a very picturesque appearance. One of the most detailed descriptions of old Broad Street was written by William Rankin Jr. in 1839 and assembled by a descendent, Russell Bruce Rankin in 1946. Entitled 'A Walk Through Broad Street' the elder Rankin described in considerable detail his ramble along Newark's most important street as his journey took him from Clay Street down Broad Street, past William Street and then returning to the Four Corners. Beginning at Clay Street, he mentions the house of botanical physician Dr. Thomas Lawrence and the confectionery and oyster shop of Andrew McBeth who lived just south of Lombardy Street. Capt. Lewis Bosworth's lodgings were on the corner of Fulton Street. It was his ship The Fox that took holiday travelers on to Sandy Hook on two-day pleasure excursions. At Park Place was the home of George Tight, watchmaker, Mr. Henderson, rector of Trinity Church, and Silas Condict, president of the Newark Banking and Insurance Company. Centre Street was the gateway to the old railroad depot and steamboat landing on the Passaic River, and was also where Captain Harvey of the packet Westminster resided. Across from the city flagpole at the southern tip of Military Park was the great Boudinot House, now the site of the Robert I. Smith Park of PSE&G. At the intersection of Commerce Street, J. Ellis kept the Newark Dressing Room and there too was the home of T.B. Crowell, editor of the Newark Eagle newspaper, the shop of John Lee, maker of fancy chairs, and home of Professor H. H. Gould, penmanship teacher. There too lived Ephrian Bolles, president of the Mechanics Insurance Company and one Dr. I.M. Ward, homeopathical physician. More prominent Newarkers resided along Broad Street between Clinton and Market including Joseph Tuttle, lawyer and member of the state Legislature, Oliver Teddy, portrait and miniature painter, and Dr. Richard Ferrand and Dr. John Darcy, of Newark California Gold Rush fame. At Bank Street were the offices of the Newark Insurance Company, and retail and wholesale store of William Rankin. The prominent lawyer and member of the U. S. House of Representatives Jabez Pennington was also a neighborhood resident. Crossing to the west side of Broad Street and heading back up town was the old Eagle Hotel, and at William Street Isaac Statia's 'colored, ' African-American, cleaning house, an antecedent of a laundry. Next door was located John O'Fake's oyster and porter house. O'Fake was to play a major role in Newark's 19th century African-American community, especially in the world of theater and musical history. Next to that building was White and Barber, druggist, and Crockett's stock and fur warehouse. Opposite Old First Church was its original Burial Ground and next to that was the city's fire china house. The fancy Stoutenberg and Day dry goods store lay between William and Market streets. The facade of this building can still be identified and recent years was known to many as the Canadian Fur Company. In the block between Market and Bank Streets were several millinery and tailor shops and Albert Lawrence's basement restaurant, a landmark. Here too was John Humphry's umbrella shop and Benjamin Olds stationery store. Olds was also a printer of great note, whose books have become collector's items. Nearby was the office of Amzi Dodd, one-time president of Mutual Benefit, and Thomas V. Johnson and Co., wholesaler and retailer of groceries in New Street, then called Speculation Street. Next door to the Public Library was the Northern Liberties Hotel with John Agens as proprietor. At this time certain prisoners were allowed to work within the city during daytime. This privilege was usually extended to civil cases and a bond was given that they would remain within a certain section of the city. To qualify for this privilege they had to have been a voter and resident of the county and 'shall have liberty to work therein; but there was a provision that if any person who had entered into a bond to keep the prison limits should voluntarily go out and beyond them, his bond should be forfeited and his sureties liable.' Rankin's tour 160 years ago of the city's splendid main street revealed a mixture of homes of the prominent as well as an assortment of commercial enterprises, a city in which commerce was still king but on the eve of a national industrial revolution in which it was to play a key role. The great street laid out in 1667 by Robert Treat has always been one of the widest thoroughfares in America, but in 1828 it still wasn't paved. It was filled with ridges and gullies, and subject to becoming a king-sized mud hole when heavy rains came to town. Many bleak descriptions of the street are part of the city's history: 'One might as well try to swim the Black Sea or cross the Mississippi on a streak of lightning.' Or, 'Not that the water is so very deep or the current so very strong, but there is mud—mud so deep and flexible—a liquid paradise for city scavengers, alias swine, to luxuriate in—it is said to be the best place in the world for a grazing porker.' Sound pretty terrible? It was! By 1820 flag stone sidewalks were added, and granite crossing walks were provided at major intersections. But it took the visit of a foreign dignitary in 1852 to make Newark pave its most important street in 1853. When Hungarian patriot Louis Kossuth had to be pulled down Broad Street in a 'stone boat,' well the time had come for even the most miserly tightwad Newarker to hold his tongue about the expense of street paving. That year Academy Street from Broad to Plane (University), Broad Street from Lincoln Park to Clay Street, and Market Street from the Pennsylvania Railroad to the Court House were finally made ready for modern traffic. 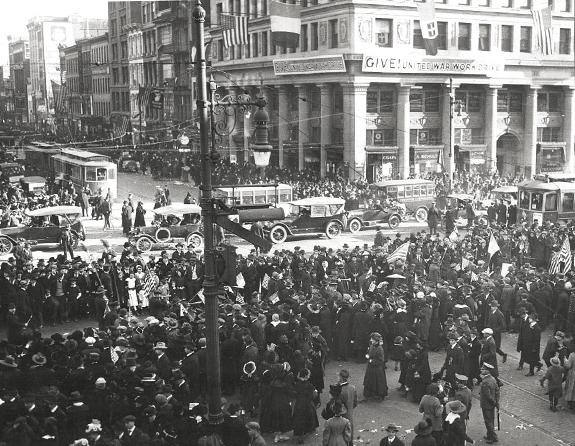 On the eve of World War I, Broad Street had acquired the reputation as the 'Busiest spot in America,' and it had become perhaps the greatest trolley center in the country. According to local police 180,000 people passed Broad and Market on foot every 24 hours, 6,000 trolleys carried more than 120,000, and 60,000 passed in automobiles. Fourteen of Newark's 21 trolley lines crossed the Four Corners, causing city and transportation officials to plan the great Public Service Terminal Building on the site of today's modern PSE&G office building in an attempt to break the traffic log jam. Today, 333 years after its establishment, Broad Street remains Newark's most important street. Now plans are under way for its continued revitalization with a special improvement district. Broad Street has endured—from the days of Colonial cattle drives to the projected light rapid transit system– as the commercial heart of town.